From simply adjusting the temperature to scheduling an upcoming vacation, you can find all the answers to your GLAS® questions here. Or you can call our customer service line, 1-833-297-GLAS (4527). How do I know if my system is compatible with GLAS? GLAS works with most 24-volt heating and cooling systems, including: gas, electric, oil, radiant and forced air. Click here to check compatibility of your system. A C-wire is a wire in your HVAC system that provides power to your thermostat. If you do not have a C-wire, don’t worry. Use the included adapter and the installation instructions to convert your heating or cooling systems to power your GLAS thermostat. Note: Double-check your current wiring for a C-wire as wires can sometimes be hidden in the wall. Do I need the included adapter? If you do not have a C-wire, you will need the adapter to power your GLAS thermostat. Where can I find GLAS’ warranty information? To view GLAS’ warranty information, click here. Where can I find GLAS’ installation instructions? To view GLAS’ full installation instructions, click here. What does the Air seal do and why do I need it? Often, the section of the wall that a thermostat is installed on is shared with the airflow path of your heating and cooling system, or a device can be installed on a drafty exterior wall. In both of these cases, air flows through the wall that is a different temperature than the air in your room. The air seal helps provide a tight seal to reduce the amount of air flowing across the GLAS device and impacting its sensors. In addition to reducing undesired airflow, the air seal provides a small amount of additional insulation, helping reduce the impact of the wall temperature changing as the flowing air changes the wall temperature. We strongly recommend installing the Air seal on your device, even if you do not suspect it to be necessary. It doesn’t look like my wires will fit through the Air seal, can I increase the size of the wire hole? No, the Air seal is not designed for modifications and increasing the size of the opening will reduce its effectiveness. The air seal is made from a pliable material that is designed to stretch and accommodate a bundle of up to ten 18-gauge copper thermostat wires, while still blocking airflow. After installing the Air seal on the back of your GLAS device, it should be possible to push the wire bundle through without modification. Can I mount my GLAS device in any orientation? No, GLAS must be installed horizontally with the display at the top of the device. The current temperature of my home does not appear correct, why is that? Numerous factors impact the temperature that is sensed by your thermostat. Depending on installation location, how the device is mounted, the type of wall material, and many other factors, GLAS may sense a temperature slightly different than the actual temperature in your space. If you did not install the Air seal on the back of your GLAS when installing your device, we strongly recommend doing so to prevent airflow in or out of your wall that could impact the sensed temperature. GLAS also requires the front cover to be installed on the device to accurately sense temperature in your home. After double checking the installation, sometimes external factors will continue to impact the device, and an adjustment is needed. You can apply an offset to the sensed temperature by navigating to Settings -> Comfort -> Temp Display and adjusting the Temperature offset to match the displayed temperature on your GLAS to another external thermostat that you rely on to calibrate the temperature. We strongly recommend waiting for a few hours after installation before adjusting the offset to ensure that the sensors have fully adjusted to the environment. When adjusting the offset, we recommend not using handheld infrared temperature sensors as a reference, as they often have multiple degrees of error tolerance. What does the Restart option do? Selecting Restart will trigger the device to shut down and reboot, without changing any settings. Typically, you should not have to manually restart your device, but if you suspect something is wrong, a restart is a great first troubleshooting step. What does the Factory reset option do? Selecting Factory reset will trigger a full reset of the device back to factory settings. This process will erase all settings on the device, and you will be prompted to run through initial configuration after the process is done. The factory reset process may take up to 20 minutes to complete, during which time your device will go through multiple stages and you may see blank screens from time to time. Please be patient and allow the process to complete. Your device will be ready to configure again once you see a screen with the GLAS logo and a Tap to continue button. I need to know the device’s Wi-Fi MAC address, where can I find it? The Wi-Fi MAC address is printed on the label on the back of your device. Alternatively, you can get the MAC address from a running device by navigating to Settings -> Support -> Device info. Why isn’t my GLAS screen illuminating? GLAS registers your presence by using the proximity sensor to detect your movements or by tapping on the screen. If your screen is not illuminating, try steadily holding your hand in front of the device’s base. How do I adjust the date and time on my GLAS smart thermostat? When connected to Wi-Fi and an internet-based time service is available, GLAS will automatically manage date and time on your device. If your GLAS device is not connected to the internet or is unable to reach an internet-based time service, you can manually adjust the date and time from Settings -> General -> Date & time. You can always adjust the time zone of your device from the same menu. Does my GLAS device have minimum on/off timers to protect my equipment? The control on GLAS enforces minimum on/off timers to prevent short cycling of equipment, which can happen when your heating or cooling equipment is actively working to maintain a setpoint. To ensure comfort, GLAS bypasses those minimum timers in response to user changes (such as changing setpoint or turning the control on/off) when safe to do so without harming equipment. However, when cooling or heating with a heat pump, the minimum off time is always enforced to protect the heating and cooling equipment. Creating a GLAS user account gives you the ability to access your thermostat from anywhere. Using the GLAS thermostat app on your smartphone or tablet, you can adjust your temperature setpoints, edit schedules, view air quality, view notifications and change your preferences. The GLAS app saves your login credentials to allow for quick and easy access to the app. To ensure a secure experience, you may be required to re-enter your credentials at certain times. A user account is not required for GLAS, but without it you will be unable to access great features like remote access, simple control of multiple devices, and detailed descriptions of air quality measurements. If I already have a Microsoft Account, can I use it? To remotely access your GLAS device, control multiple locations, and take advantage of the detailed descriptions of air quality measurements, you will need to create a new GLAS account on your smartphone or tablet. Your Microsoft Account will be necessary in order to take advantage of Cortana on your device to control GLAS and other smart home devices that work with Cortana. Don’t have a Microsoft Account? Don’t worry, you can easily create one at account.microsoft.com while you set up Cortana. Where do I find air quality? To access air quality information, swipe left from the home screen and select Air quality on your GLAS thermostat or the GLAS thermostat app. In the air quality section, you will find reporting on total Volatile Organic Compounds (tVOCs), equivalent CO2 (eCO2), and Relative Humidity. When connected to Wi-Fi, you will also be provided with reporting on outdoor allergens, the Air Quality Index (AQI), and UV Index. GLAS helps you monitor your indoor and outdoor air quality. The sensors onboard GLAS measure Total Volatile Organic Compounds (tVOC), equivalent Carbon Dioxide (eCO2), and Relative Humidity inside your home, and when you are connected to Wi-Fi, GLAS reports your area’s outdoor allergens, Air Quality Index (AQI), and UV Index. How can I find out more information about my current air quality? To access air quality, swipe left from the home screen and select Air quality. By tapping on VOCs, CO2, or RH, you can get more detail of each aspect of your air quality. By swiping to the left, you will see the outdoor air quality. Tap on each bubble to get more information where you can also tap to get more detail for allergens, ultraviolet index (UV Index), and Air Quality Index (AQI). What are tVOCs and why are they important? For more information on air quality and its importance for personal and home health, see the Environmental Protection Agency’s report here. Humidity is the amount of water vapor in your air. Proper levels of humidity are important for maintaining personal and home health. Extremely high or low levels of humidity can cause damage to your building fixtures, such as hardwood floors, and discomfort for occupants.8 When connected to Wi-Fi, GLAS will recommend the optimal humidity for the current outdoor temperature and work to keep your home at those target levels if you have an auxiliary device that can impact humidity, such as a humidifier, dehumidifier, or ventilator. What are allergens and why are they important? What is Air Quality Index (AQI) and why is it important? Why is GLAS reporting my air quality as fair or poor? Many things can cause reduced air quality in your home. The most common source of CO2 and VOCs are from people and animals breathing, cooking, and use of chemicals, such as household cleaners or paints.2 The sensors onboard GLAS monitor your home’s indoor air quality, allowing you to keep tabs on your home’s overall air quality and take action to improve it when necessary. Can GLAS improve air quality in my home? GLAS can actively improve your home’s air quality if you have ventilation equipment installed in your home.5 The auxiliary (AUX) terminal of your GLAS can be used to operate ventilators, including energy-recovery and heat-recovery ventilators. These devices use fans to exchange stale air with fresh air from outside, and in the case of the energy- or heat-recovery varieties, can do so in a very energy-efficient manner. GLAS uses its air quality sensors and information about outdoor temperature and humidity to intelligently operate your ventilator to maximize air quality and minimize energy usage. I have a ventilator in my home, but it’s not connected to my thermostat. Can GLAS still help control my air quality? Many ventilators engage the furnace fan, instead of having a separate fan for the ventilator. With these installations, any time the furnace fan operates, your ventilator will also operate to bring fresh air into your home. Without a wiring change, GLAS can still use this system to help you manage air quality. We recommend you do this by enabling Minimum hourly fan runtime as well as Smart circulation features. This will allow GLAS to manage your home’s air quality even when heating or cooling is not running, but also avoid needlessly running your fan and ventilator. Even so, we recommend having a professional modify the installation so that GLAS can directly operate your ventilator. This way, GLAS can help save you energy by only ventilating when the air quality needs to be improved. Can I install a ventilator in my home so GLAS can improve my air quality? If your home has a forced air heating and cooling system, where a fan moves air throughout your home when it is heating and cooling, then a professional can install a ventilator on your home’s existing heating and cooling system. The installation would involve installing ductwork for the ventilator in your return air duct, and two vents to the outside of your home. Your local YORK authorized heating and cooling professional can make a personalized recommendation for your specific home, but typically we recommend a YORK Affinity Energy Recovery Ventilator for homes located in the southeast US, and a YORK Affinity Heat Recovery Ventilator for homes located elsewhere in the US, or in Canada. Smart ventilation is a feature available when GLAS is configured to control a ventilator and is turned on by default. When enabled, GLAS will intelligently control your ventilator to only operate it when air quality is poor, ventilation can help assist with cooling or heating, or to dehumidify in the winter. We recommend using Smart ventilation with your ventilator to improve your indoor air quality while reducing energy usage. Can GLAS help improve air quality if I do not have a ventilator? If your home does not have ventilation equipment, GLAS cannot directly improve the air quality in your home. Besides contacting your local YORK authorized heating and cooling professional about installing a ventilator, we recommend making use of the Minimum hourly fan runtime feature as well as Smart circulation. When both of these features are enabled, GLAS will work to distribute air throughout your home when poor air quality is detected by the GLAS device. Is there anything I can personally do to improve my home’s air quality? Does the air quality sensor in GLAS sense airborne particles, such as pollen or other allergens? The air quality sensor in GLAS can sense certain volatile organic compound (VOC) gases but does not respond to airborne particles. When connected to Wi-Fi with a valid postal code entered, GLAS provides information about outdoor allergen levels to help you understand your potential impact. While GLAS cannot react to indoor allergens, we recommend that allergy-sensitive customers install a high-MERV7 filter during allergy seasons to improve their home’s air quality. What is Equivalent CO₂, or eCO₂? The air quality sensor inside GLAS measures volatile organic compounds (VOCs), and one of the VOCs measured by the sensor inside GLAS is hydrogen (H2). GLAS uses the sensed H2 levels in the building to estimate the level of carbon dioxide (CO2). What type of air filter should I use in my home? The higher the MERV7 rating on a filter, the fewer contaminants – including dust and pollen – will get through the filter. However, higher MERV filters cost more to purchase and more to operate by reducing airflow and causing your furnace or air handler’s fan to have to work harder. For most homeowners, a basic fiberglass filter is sufficient. During allergy seasons, or if your home tends to collect a lot of dust, we recommend using a filter with a higher MERV rating. Can GLAS tell me when to replace my air filter? Yes, GLAS can notify you when it’s time to change your air filter. Two options are supported – Auto or Manual. We recommend Auto, which calculates when the filter should be replaced based on runtime of your heating and cooling system. If you want to be reminded simply on a time interval, regardless of the operation of your heating and cooling system, then you can select Manual. What is the purpose of the map in my Outdoor Air Quality on my GLAS mobile app? The heatmap uses your postal code information to display real-time outdoor air quality for your area to inform you about the air near your home or current location. Can I manually turn my fan on with GLAS? Yes, GLAS supports Auto and On modes for your fan. When in Auto mode, GLAS will automatically run your fan as necessary with heating, cooling, or as otherwise necessary. When in On mode, GLAS will continuously run your fan. After selecting On, you can optionally select a specific amount of time to run the fan for before going back to Auto mode. Can GLAS continuously run my fan when I’m home or sleeping? Can GLAS help ensure air is periodically circulated through my home? Yes, GLAS supports a feature called Minimum hourly fan runtime. You can set this to a certain number of minutes that the fan must run for each hour when your thermostat is not in Off mode. If your system does not operate the fan for at least the specified minimum duration due to heating or cooling, GLAS will turn on the fan to circulate air throughout your home. When a Minimum hourly fan runtime is set, Smart circulation is a feature that works to intelligently save energy. When GLAS senses that your home’s air quality is good, it will not enforce the minimum hourly fan runtime. This saves energy by not needlessly circulating air throughout your home when the air quality is already good. When Minimum hourly fan runtime is configured, Smart circulation is turned on by default. From the home screen, swipe left to access quick view and select schedule. Your device will assist you in setting up your wake and sleep times, and creating events. Select the “plus sign” in the upper right corner of the calendar view. An Away event allows you to place an event with your preselected Away setpoints for a specified start and end time. After adding the event, it will appear on your schedule. I received an error when trying to schedule two events at the same time. Scheduled events cannot overlap because the thermostat is only able to respond to one event at a time. If you would like to change the temperature in your space at a scheduled time, you can edit your existing event or delete the event and replace it with a new one. How do I edit temperature preferences? To edit your temperature preferences, go to Settings ->Comfort ->Temp preferences and select the temperature setting you would like to adjust. You can edit your preferences for Home, Away, and Sleep. Can GLAS automatically sense my presence? Yes, GLAS has a built-in occupancy sensor that is used to determine if someone is home. When enabled, which it is by default, GLAS will use the sensor to intelligently switch your device between Home and Away states to ensure comfort when you are home and energy savings when you are away. Over time, GLAS will begin to learn your home’s typical patterns and intelligently use the sensor to switch between Home and Away states. GLAS uses the sensor in conjunction with your schedule to ensure that your home won’t switch to an Away state while you’re asleep, or that you won’t wake up to a cold home if you sleep in a bit. I’m leaving my home for a few days, can GLAS help me save energy while I’m away? Yes, GLAS supports scheduled vacations. Simply navigate to Settings -> Vacation on your GLAS device or the mobile app and schedule the time that you will be away from your home. GLAS will automatically transition to an Away state for the duration of the vacation, and then return to your schedule when your vacation ends. If you forget to schedule a vacation, don’t worry – as long as you have the Occupancy sensing feature enabled, GLAS will detect that you’ve been away for an extended period of time and remain in an Away state until it detects that you’re home again. When you set up a schedule in GLAS, you tell the device when you wake up, leave, return, and go to sleep. But not everyone’s schedules are the exact same every day, and some days you may not return home until hours after your scheduled return time. Typically, GLAS will wait to transition from a scheduled Away state to a Home state until the occupancy sensor detects that you’ve actually returned home. While this can save energy, it might also mean returning to a warmer or cooler home than you’d like. By enabling Arrival Anticipation, GLAS will transition to the Home state at the end of a scheduled Away state, even if you haven’t returned home yet, ensuring that your home is comfortable when you return. Pre-Start learns how your heating and cooling system behaves over time and uses that to intelligently start your heating or cooling early so that your home is back to your Home temperature preferences when a scheduled Home period begins. When enabled, Pre-Start will always activate at the end of a Sleep period. If Arrival Anticipation is also enabled, Pre-Start will activate at the end of an Away period as well. What Auxiliary devices can GLAS control? GLAS also supports configuring the auxiliary output in “On while occupied” mode, which will turn the auxiliary output on anytime the device is in “Home” or “Sleep” modes, and off when it’s in the Away state. What can GLAS do with a ventilator? What can GLAS do with a humidifier? GLAS can control all types of humidifiers to increase humidity in your home during the dry winter season. Bypass and fan-powered humidifiers that work in conjunction with your heating system are supported, as well as steam humidifiers that can run even when heating is not running. You can manually set the humidity setpoint, or, when connected to Wi-Fi with a valid postal code entered, GLAS can automatically operate your humidifier to the optimal humidity for the current outdoor temperature. What can GLAS do with a dehumidifier? GLAS can control dedicated dehumidifier appliances. Dehumidifiers that are built into your heating and cooling system and work alongside the fan are supported, as well as standalone devices that can operate on demand. You can easily specify the desired humidity in your home, and GLAS will work to keep it at that level. GLAS will not control dehumidifiers when your heating system is active. What is the “On while occupied” Auxiliary device setting? On while occupied is a mode aimed at advanced users controlling lighting or other specialty applications in a commercial setting. When GLAS is in a Home or Sleep state, the output will turn on. When in an Away state, due either to the schedule or the occupancy sensor, the output will turn off. What is the type of signal output by GLAS to the AUX terminal? GLAS outputs 24 volts AC when the AUX terminal is engaged. Power to the AUX device is sourced from the RC terminal. What does “Auto” mode do for my Humidity setpoint mode? During the winter, as outside temperatures drop, the optimal humidity level in your home changes. – The colder it gets outside, the lower the optimal humidity level in your home is. While your home might feel more comfortable at a higher humidity, when the outside temperature is very cold, a low humidity is important for the health of your home. – A low humidity level when the outside temperatures are very low is important to prevent frost on windows, and excess condensation in your walls leading to mold growth. When Humidity setpoint mode is set to Auto, and your GLAS is connected to Wi-Fi with a valid postal code entered, GLAS will automatically adjust your humidity setpoint as the outdoor temperature changes. Does GLAS support heat pumps with auxiliary heat? Yes, GLAS supports controlling up to two heat pump compressor stages, as well as up to two auxiliary heat stages. GLAS can also control heat pump systems without auxiliary heat. Does GLAS support dual fuel heat pump systems? Yes, GLAS supports heat pump systems with electric, gas or oil auxiliary heating. GLAS’s internal algorithms optimize the operation of your heat pump and auxiliary heat so it always uses the most efficient type of equipment at all times, when your device is connected to Wi-Fi with a valid postal code entered. What do the “Heat pump staging mode” options do for my heat pump? Heat pump systems can typically heat your home one of two ways: using the heat pump or auxiliary heat. Depending on the outdoor temperature, the auxiliary heat might be an inefficient way to heat your home. GLAS uses advanced algorithms to intelligently operate your heat pump and auxiliary heating to ensure your home remains comfortable while also preventing unnecessary energy usage. This adjustment gives you control over how your equipment runs, allowing you to adjust for the best blend of comfort and energy savings for your home. What does the “Auto” option for “Heat pump staging mode” do for my heat pump? When in Auto mode, GLAS will use the most efficient heating method to heat your home, but if it senses that your home is taking abnormally long to heat up, it may also engage the less efficient equipment to ensure your home reaches and stays at the desired temperature. This option is the default, and best for most users. GLAS will never needlessly use energy when set to this mode, but will ensure that your home is never uncomfortably cold. What does the “Auto Savings” option for “Heat pump staging mode” do for my heat pump? When in Auto savings mode, GLAS will operate similarly to the Auto mode, but strongly prefer using the most efficient heating method to heat your home. Only if it senses that your home is heating at an exceptionally low rate, and more than a few degrees away from the desired temperature, will the less efficient equipment also be engaged. When this option is selected, GLAS will ensure that the least energy is used, but your home may take longer to warm up. What does the “Manual” option for “Heat pump staging mode” do for my heat pump? When connected to Wi-Fi with a valid postal code entered, GLAS allows you to specify the outdoor temperatures above which auxiliary heat will never run, and below which auxiliary heat will be preferred as a more efficient method of heating. After setting your Heat pump staging mode to Manual, you’ll be able to adjust the exact thresholds to match your equipment. What types of heat pumps are supported by GLAS? – Outdoor Unit (air-sourced). These heat pumps are very prevalent in the southern US and coastal regions. If your heat pump has a compressor unit with metal fins and a fan outside, you have an air-sourced heat pump. – Water-sourced. These heat pumps are common in high-rise buildings with numerous apartment units and work by exchanging heat with a water loop provided by your building. Typically, this type of installation would only be done by a professional installing the thermostat in your building. What is a reversing valve, and how do I know what type I have? The compressor system on your heat pump can either heat or cool your home by switching the direction that the refrigerant flows in your system. The reversing valve controls whether the system operates in a heating or cooling mode. Depending on the model of your heat pump, some switch into cooling mode when the reversing valve is powered, and others switch into heating mode when the reversing valve is powered. It is important to select this correctly, or your thermostat will heat when it means to cool, and cool when it means to heat. Often, the wire color is used to indicate the type – blue for B-Type and orange for O-Type. However, this is not guaranteed to be the case. We strongly recommend using the equipment test feature during the initial setup, to verify that you have the correct reversing valve type selected. During the test, if you feel hot air when it should be cooling, or cool air when it should be heating, press No when asked if you feel the right air coming from the vents, and then select Yes when prompted to reverse the reversing valve polarity. At that point, confirm that you now feel the correct air temperature coming from the vents. What are the temperature setpoints? The Heat or Cool setpoint is the temperature the room has to reach before the heating or cooling will turn off. What are home, away, and sleep temperature preferences and how do you set them? To set your temperature preferences for home, away, and sleep, go to Settings -> Comfort -> Temperature Preferences. From there you can select your desired heating and cooling temperature for each of the three modes. Sleep mode is the temperature settings you select for your waking and sleeping hours. Your regular hours can be added to your GLAS thermostat so it will automatically adjust to your schedule and repeat daily. Home and away are the temperature setpoints you select to maintain comfort while you’re home and save energy while you’re away. How do temperature preferences benefit my space? Temperature preferences conserve your energy by allowing you to adjust the space based on need and comfort level. As the environment changes, your system will respond to what you need. By adjusting these setpoints, GLAS will ensure you’re comfortable at all times. In the summer, the higher you set your away and sleep setpoints, the more energy your GLAS can save you. And in the winter, the lower you set your away and sleep setpoints, the more energy your GLAS can save you. What are emergency heating and cooling setpoints? Emergency heating and cooling are setpoints designed to protect your building from freezing or overheating. These setpoints will power on the system to protect your home, regardless of schedule or operating mode. When you place your system in off mode it will not run, regardless of schedule or occupancy. To put your system into off mode, swipe left from the home screen and select Off. In Off mode, you can manually activate the fan. However, Hourly fan runtime and air quality control features will not activate. Heat protection and freeze protection will still activate in Off mode in the event that the emergency heating or cooling setpoint is reached. What are the Temperature Preferences on the GLAS device? Temperature preferences are the temperatures that the GLAS device will work to keep your home at for the different occupancy states of your home. As your home switches between Home, Away and Sleep states, GLAS will keep your home at these selected temperatures to keep you comfortable when Home and save energy when Away. Can I select what unit of temperature to use on my GLAS device? Yes, GLAS can display temperature in Fahrenheit or Celsius. You can easily change it by navigating to Settings -> Comfort -> Temp display and adjusting the Temperature unit on your device. What is the temperature shown on the home screen of my device, and what happens if I change it? The temperatures shown on the home screen of your device and the GLAS mobile app are the temperatures that GLAS is currently controlling your home to. Typically, these are set to the Temperature Preference for the current state of Home, Away or Sleep. At any time, you can manually change the temperature in your home from the home screen of your device, the GLAS mobile app, or through Cortana. GLAS will then automatically switch back to the preset temperature preferences when your home next switches between Home, Away and Sleep. Why can’t I have my cooling and heating set to the same temperature? GLAS operates by cycling your heating and cooling system on and off to keep your home near the temperature preferences. GLAS requires a minimum of 2 degrees Fahrenheit, or 1 degree Celsius, between your heating and cooling temperatures, to prevent the thermostat from needlessly switching between heating and cooling modes. If you set a cooling or heating temperature too close to the opposite one, GLAS will automatically adjust the other temperature to be 2 degrees Fahrenheit away from the temperature you just adjusted. To save money on your energy bill, we recommend that you pick a wider range for your temperature preferences so that your GLAS does not have to operate your heating and cooling equipment as often. How do I get energy savings reporting? Tracking your energy savings is a great way to view your current usage and find ways to improve energy conservation. To view your energy savings, swipe right from the home screen and select the Energy savings button. How does GLAS calculate energy savings? GLAS calculates energy savings by learning about your heating or cooling systems and accordingly creating an algorithmic model that applies specifically to your space. After connecting to Wi-Fi, entering your postal code, setting up a schedule, and heating or cooling your space, GLAS creates a thermal model after a few days of runtime. Utilizing this information along with outside weather data, GLAS calculates how much energy you are saving when compared to operating only at your preferred Home setpoints for cooling or heating. You’re able to view your energy savings history up to 7 days and the reporting will update in real time to reflect the current day. How can I improve my energy savings? There are a few things you can do to improve your energy savings. By creating schedules, activating occupancy detection, and selecting set points for home, away and sleep modes, you can ensure that the thermostat runs only when you need it. To set your temperature preferences for home, away, and sleep, go to Settings -> Comfort -> Temp preferences. To set schedules and events, swipe left from the home screen and select Schedule. Follow the prompts to set up your schedule. To ensure occupancy detection is activated, go to Settings -> Comfort -> Schedule preferences. Why should I take advantage of energy savings? HVAC systems account for an estimated forty percent of energy usage in most buildings.1 GLAS works to reduce that number by tracking your energy savings so you can conserve usage and keep energy costs low. My GLAS device only shows me hours of runtime, not energy savings. Why not? GLAS has a built-in, advanced algorithm to learn how your home’s heating and cooling system operates. These algorithms monitor how your system responds and predicts how much more your system would have had to run had it remained at the Home temperature setpoint all day. To provide accurate data, this algorithm has many conditions that must be met before it can begin calculating energy savings. Your device must be connected to Wi-Fi with a valid postal code entered, and you must have a schedule setup on your device. Once those conditions are met, GLAS will require some time to learn a temperature model of your heating and cooling system, as it heats or cools your home. Depending on how much your heating or cooling runs each day, it might take a few days to learn an accurate model and begin estimating your savings. Once GLAS is able to start estimating your energy savings, the icon will change from runtime to savings, and tapping on it will display a graphic of your energy savings in addition to runtime. My energy bill did not go down by the amount GLAS shows. Why not? Heating and cooling consumes a large amount of energy in your home, but it is still only a portion of your home’s total energy usage.1 GLAS calculates an estimate of how much less energy your heating and cooling system consumed than it would have, had it remained at your Home temperature all day. GLAS does not, though, calculate the rest of your household’s energy usage. This calculation is based on learning the unique characteristics of your own heating and cooling system, but this calculation is not a guarantee of savings. Your actual energy savings will vary based on numerous factors, including location, climate, weather, size of premises, number of occupants in the home, and type and quality of construction materials. How do I set up Cortana on my GLAS? When you first purchase your GLAS smart thermostat, you will need to first set up your GLAS. As part of the GLAS setup, you will connect your GLAS to Wi-Fi. Connecting your GLAS to Wi-Fi allows your GLAS to download Cortana. You will receive a notification on your GLAS when the download is complete and you need to restart your GLAS to begin setting up Cortana. From the Settings menu, navigate to General -> Cortana. From here you will need to use your Microsoft account information to log in and complete the on-screen instructions to complete your Cortana setup on your GLAS. Why do I need to set up an account with Microsoft to use Cortana on my GLAS? To use Cortana on your GLAS, you will need a Microsoft account because Cortana is a personal digital assistant that works best when it can learn about you and your activities by using data from your GLAS device and other Cortana-enabled devices, and other Microsoft services. You can choose whether to enable Cortana on your GLAS, and you can turn off Cortana at any time. You will use your Microsoft account to change Cortana settings. Why may I need to re-enter my Microsoft credentials at some point to continue using Cortana on my GLAS? To ensure a secure and enjoyable experience, GLAS and Cortana may require you to re-enter your credentials periodically, depending on your use and other factors. If Cortana asks you to sign in again, your account has not been able to keep you signed in automatically so you’ll need to re-enter your credentials to maintain functionality. Can I control GLAS through other Cortana-enabled devices? Yes. After you set up your GLAS and enable Cortana on your GLAS, you can use any Microsoft Cortana-enabled device to control your GLAS smart thermostat. Please note that to use Cortana to control your GLAS, your GLAS and the other Cortana-enabled device both must be connected to the internet. What kind of commands are supported through Cortana? – What’s <my GLAS device name> temperature? Additionally, you can use any other Cortana commands from your GLAS, such as “Hey Cortana, what’s the news?” or “Hey Cortana, how’s my schedule looking?” to leverage Cortana’s connection to your Microsoft Outlook account and keep up-to-date with your appointments and events. Subscribe to GLAS updates to learn about new Cortana commands for your GLAS. Can I connect other voice assistants to GLAS? Yes. When using a connected Google Home Speaker, GLAS works with the Google Assistant allowing you to control functions such as temperature changes with your voice. 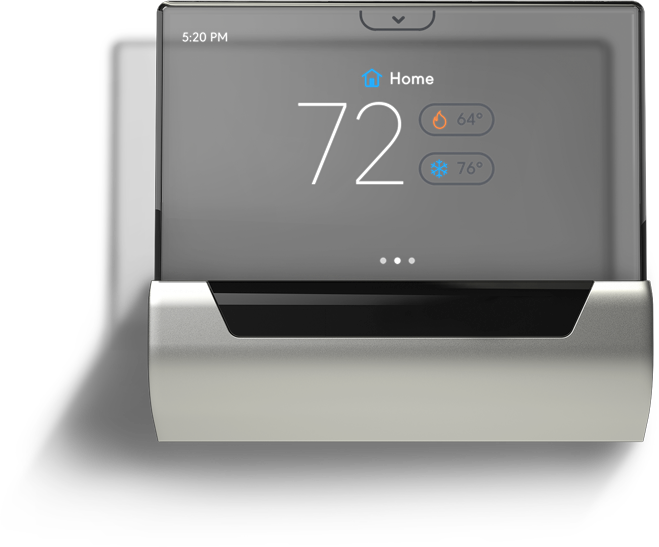 In addition, GLAS works with Amazon Alexa allowing you to control your thermostat through an Alexa-enabled device such as Amazon Echo. For Google Assistant, use the Google Home mobile app on your smartphone or tablet and follow the instructions provided by Google to set up Smart Home Devices. From your home Wi-Fi, use your GLAS username and password to establish a connection between the Google Assistant and your GLAS smart thermostat. For Amazon Alexa, you will need to use either the Alexa mobile app on your smartphone or tablet or visit echo.amazon.com on your web browser. From your home Wi-Fi, use your GLAS username and password and follow the steps provided by Amazon here. Note that voice assistants use the same name you gave your GLAS during setup and installation. This will help your voice assistant distinguish control of different GLAS devices in your home. What commands can I use for Amazon Alexa? – What’s <my GLAS device name> thermostat temperature? What commands can I use for Google Assistant? How do I get the mobile app for GLAS? To get the mobile app for GLAS on your Apple or Android smartphone or tablet, navigate to the Apple App Store or Google Play Store and search for GLAS by JCI. You can also click the buttons below. How do I connect my mobile smartphone or tablet to my GLAS? To connect your smartphone or tablet to your GLAS, you will need to link your GLAS mobile app and the GLAS smart thermostat. After you have downloaded the GLAS mobile app to your smartphone or tablet, log in with your GLAS account or tap Sign up to create an account. Once you have signed in to your account, use the Account Management screen to add a location and then the GLAS app will help you add a device, or tap on an existing location and then tap Add device. The mobile app will walk you through how to connect your app to your device with a pairing key generated on your GLAS smart thermostat. Can I connect multiple GLAS smart thermostats to my mobile app? Yes. You can connect up to 100 GLAS smart thermostats to your mobile app. Can I control GLAS smart thermostats that are installed in different homes or locations from a single app? Yes. You can control many GLAS smart thermostats in one home or many GLAS smart thermostats across many homes. Ensure that you use a clear naming system to help you know which location and which GLAS you are controlling at any time. Which GLAS features are supported by the mobile app? Your GLAS mobile app shares all the same features as your GLAS smart thermostat. You can use your GLAS mobile app to control the temperature, heating or cooling mode, fan runtime, and other features. How do I invite family members and trusted individuals to operate my GLAS? From the Account Management screen on your GLAS mobile app, select Invite users. Then, you can enter the email address of an individual whom you want to give access to operate your GLAS. Please note that anyone you give access to will have control over your GLAS; however, you will retain ownership of the device and the location and other invited users will not be able to remove your control. What kinds of data does Johnson Controls collect when you use GLAS? Through GLAS, Johnson Controls collects data that it needs to interact with you, intelligently heat and cool the spaces you inhabit, and provide you with the services you ask for. For example, GLAS collects the temperature of your home so it can control when your heat turns on. GLAS also detects movement inside your home so it can tell when no one is home and turn off your heat. GLAS also collects information about the air inside your house to help you monitor air quality and help us intelligently change settings. We also collect data about you, such as your name, zip code, email address, and password, to make GLAS more intelligent and so you can control your account. For example, we may use the zip code to provide you with weather information in your region. For more information about Johnson Controls’ privacy practices, please review the Johnson Controls Privacy Notice. Does GLAS know when I’m home or not? GLAS uses sensor data to detect when people are in your home. This makes the GLAS device more intelligent, since it can turn down your heat when you leave and turn it back on when you get home. GLAS is also continually learning from your preferences and daily rhythms to help you keep your home comfortable, monitor your air quality, and regulate your energy use. Do any third parties have access to the data collected from my home? In general, you control who has access to the data collected through GLAS. For example, you can enable the onboard Microsoft Cortana digital assistant or pair the device with another third party digital assistant (such as Amazon Alexa or Google Assistant) to allow voice control of GLAS. It is up to you whether you want to interact with these third parties through GLAS. If you do, then the data they collect about your home is subject to their privacy policies. Does Johnson Controls sell the data that it collects from my home? Johnson Controls does not sell your data. Johnson Controls uses the data GLAS collects from your home to provide and improve GLAS and its other products and services. Does GLAS have ads on it? No. GLAS was designed to be beautiful and intelligent, inside and out, and to improve the atmosphere in which you live and work. Ads don’t serve these purposes, so we don’t include them on GLAS. How does Johnson Controls keep my data safe? Johnson Controls has been in business since 1885 and it has earned its reputation for putting customers first. Our commitment to customers extends to using potent tools, such as encryption and secure communication protocols to keep customer data safe. Can I get professional help to install my GLAS? Yes. Through a partnership with installers in your area, GLAS can offer professional help to get your GLAS installed quickly and correctly from the very beginning. Use the Find an installer link on the GLAS.johnsoncontrols.com website to enter your postal code and pick an installer. Johnson Controls ensures that each professional installation comes from a trusted professional in your area, supports local businesses and gets the job done right. Will GLAS connect to my router? GLAS requires a 2.4 GHz router for connection and operation compatible with 802.11 b/g/n networks. Mobile hotspots and guest networks are not recommended. Enterprise networks and captive portals are not supported at this time. Connection to Wi-Fi is part of the set-up process you will walk through during installation. If you would like to make any updates to your Wi-Fi connection, go to Settings -> General -> Wi-Fi. Use the list provided to select the new network you wish to connect to and enter the password. If the network you would like to use is not shown in the list, scroll to the bottom of the screen and select Other. Type in the name and password of the network you wish to connect to. The new network will be added to the network list. How do I disconnect from Wi-Fi? To disconnect from a Wi-Fi network go to Settings -> General -> Wi-Fi and select the “i” icon beside the connected network’s name. Select Forget Network and your system will disconnect. If you have entered passwords for other networks, your system will automatically connect to them. If you would like to completely disconnect from Wi-Fi, repeat the process for all connected routers. Why should I connect to Wi-Fi? Connection to Wi-Fi allows you to get the most out of your GLAS thermostat. A Wi-Fi connection tracks the outdoor weather in your area to help you choose the most efficient temperature settings. Outdoor weather tracking also allows the thermostat to calculate your energy savings to improve your energy usage. Using Wi-Fi also allows you to access your thermostat remotely from the web or your mobile device. With remote access, you can control your building’s temperature, adjust schedules, view energy savings, and power your system on or off. Say hello to a clearly smart home. Sign up for GLAS updates.